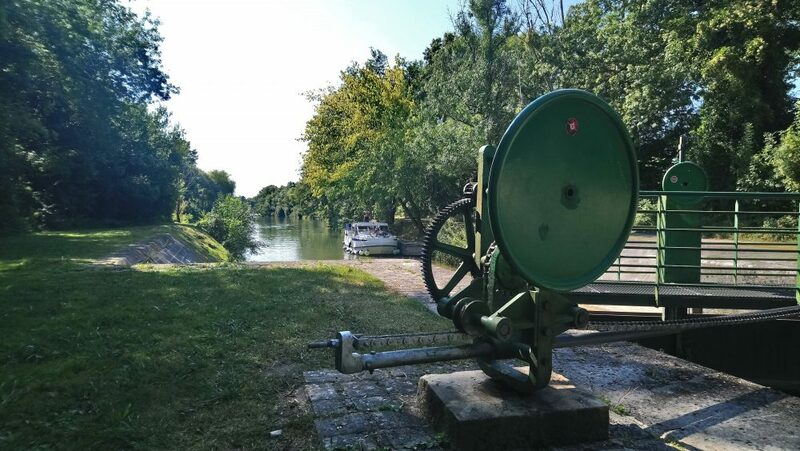 In September 2018 we gave Les Cannalous a shot for a summer get away on the French Canals. This was our first adventure with this company, but we managed to bag a great deal – see here for some handy tips on how to get the best price possible for your trip. In true ‘Muffin’ style we booked a boat only 48 hours before we “boarded” which helped us to secure a good price but also allowed us to check out the more reliable weather forecasts in advance to ensure we would have sunny blue skies for the duration. Les Cannalous’s customer service was superb and they really understood the value of a last minute booking and worked with us to get the right deal. The Boat was HUGE but very easy to drive (we are not ‘boaty’ people by any means!). Very spacious for 2 people with 2 large bedrooms and plenty of communal space. Possibly our favorite boat layout to date! The boat is advertised to sleep 6 but 4 adults or a small family would be just about right. 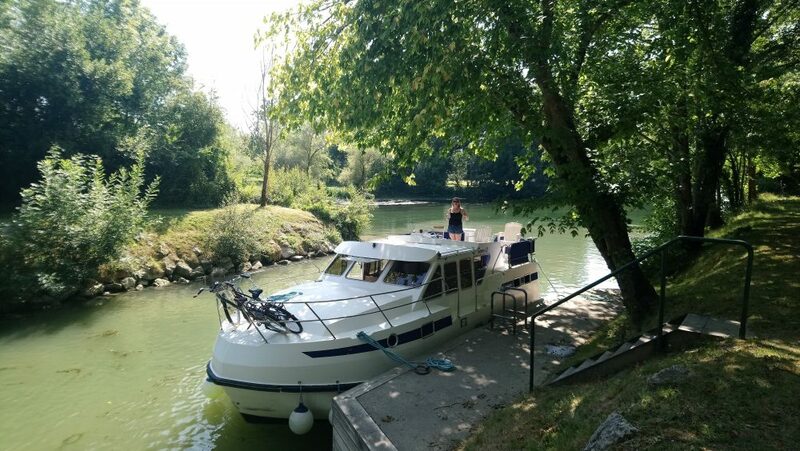 The route we chose to take for a week on the Charante was as follows: Upstream Cognac to Angouleme – Downstream Return to Cognac – Onward to Saintes – Upstream Return to Cognac. The entire trip took us a leisurely 6 days. I wont lie the upstream part from Cognac to Angouleme and then back to Cognac took its toll on my poor pathetic little arms! Many MANY locks were opened and closed – 21 each way! It was exhausting as unusually for French rivers and canals all the locks were manual. Not in the same fashion as English Canals with a big odd shaped key mind. These manual locks all had inbuilt wheels to turn which made it a little easier but hard work all the same. A little tip here is to buy some good grippy gloves – aside from keeping the skin on your hands they stop you from getting burned when the wheel gets hot from the mid-day sun! “NEGATIVE” POINT – Easy collection from the base in Cognac but only basic English spoken so be prepared with your French! “NEGATIVE” POINT – Not a great deal to see from the river. 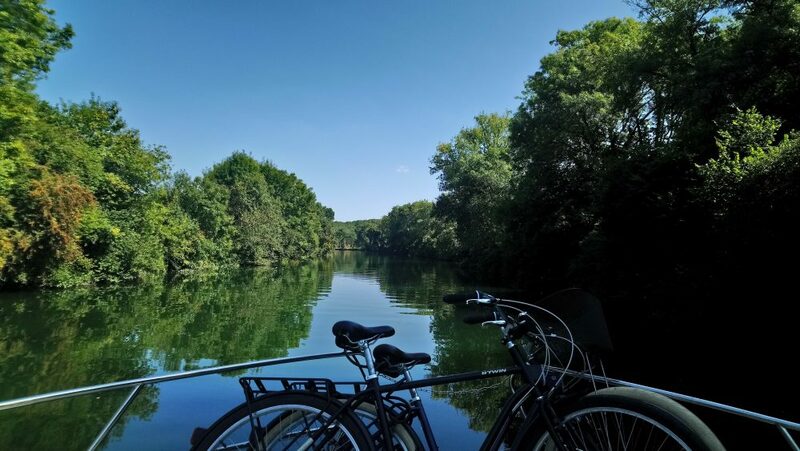 Sightseeing is possible but you need to leave the boat (unlike some rivers & canals in France that literally take you through Unesco World Heritage sites) so bikes are a good idea. All in all a perfect little trip for a couple seeking some solitude and a spot of exercise! 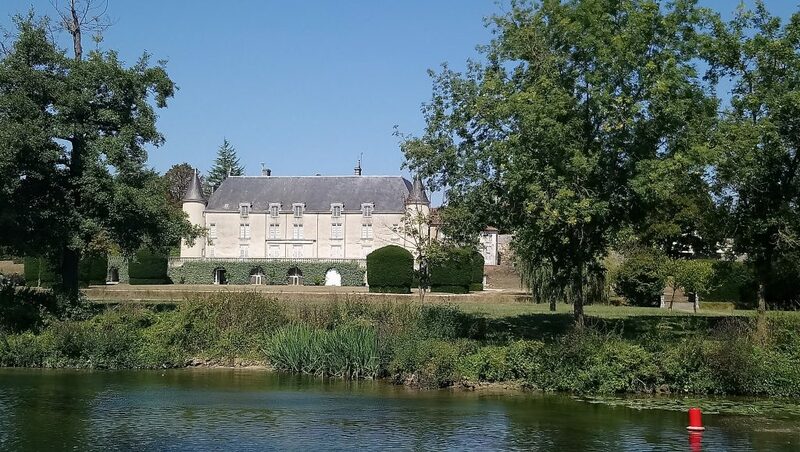 After a couple of hours “sailing” you come across a Chateau on the riverside in Jarnac which is owned by the Courvoisier family. It’s a great little space to stop for a little lunch on their own pontoon. 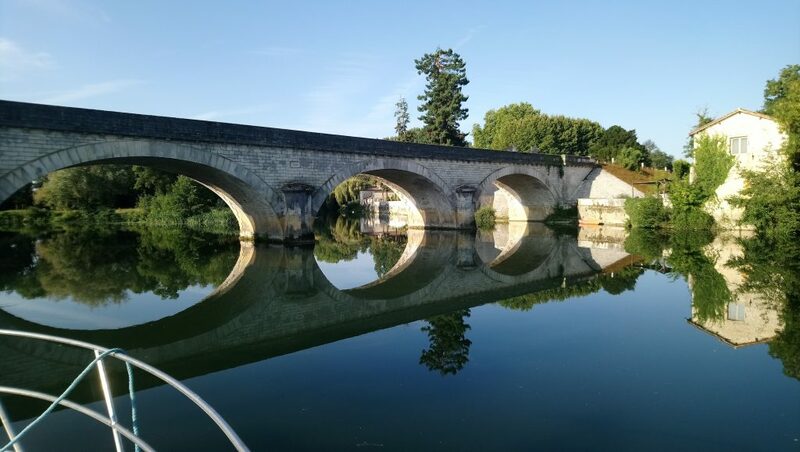 A couple more hours further up river and we overnighted on a pontoon next to a bridge by Bassac made famous during WW2 as the British Commandos crossed here while escaping the invading forces. There is a cute little Gite opposite with lovely views and a boisterous English group in residence while we were there! Saw us passing through Saint Simeux which has an odd set up on the weir for Eel trapping. Quite a curiosity when you read up on it. It became a huge part of the locals social lives with parties to celebrate the giving nature of the river. 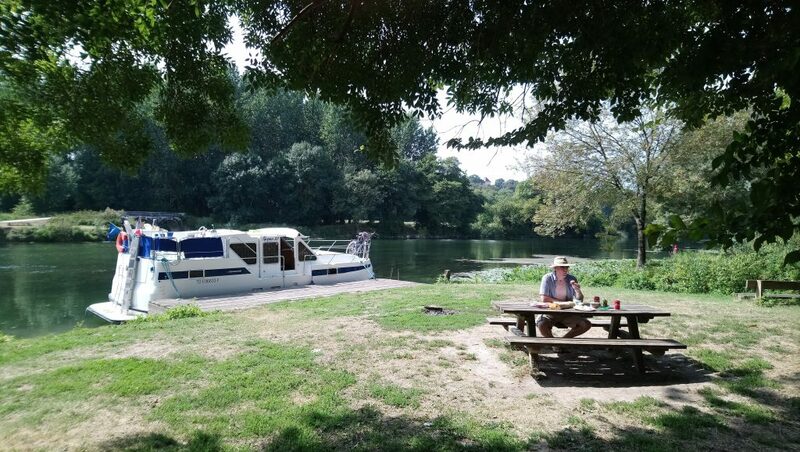 Day two also happened to be my birthday so we celebrated by mooring on the side of the river further upstream and had a huge BBQ of sardines and salad purchased from the local village followed by a movie on the top of the boat under the stars! Quite a lovely evening with total piece and quiet. French seafood is exceptional! Day 3 included a first for us! 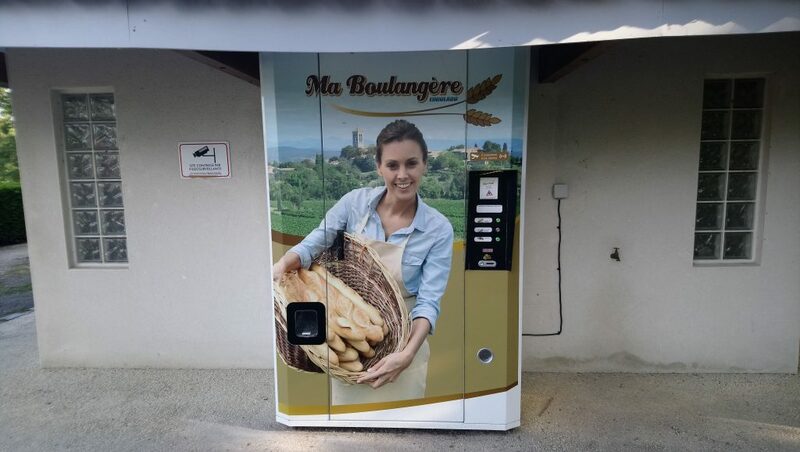 We purchased our daily fresh bread supply from a vending machine! Yes really! Located at campsite near the Nicholls boat base and serviced by a local roving bread maker. The quality was pretty good! 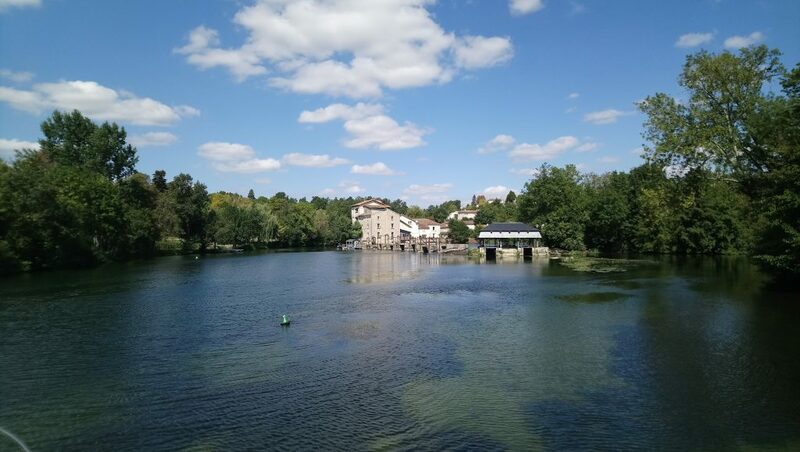 Onwards and further upstream we reached the town of Angouleme which was the farthest point up river we intended to travel. The town is not the prettiest of France but it does have some lovely cultural highlights with museaums and art galleries a plenty. After a quick explore (quick because it’s a town and therefore full of people which is far too noisy for our liking!) we turned around and headed back down stream to find a little spot for the night. 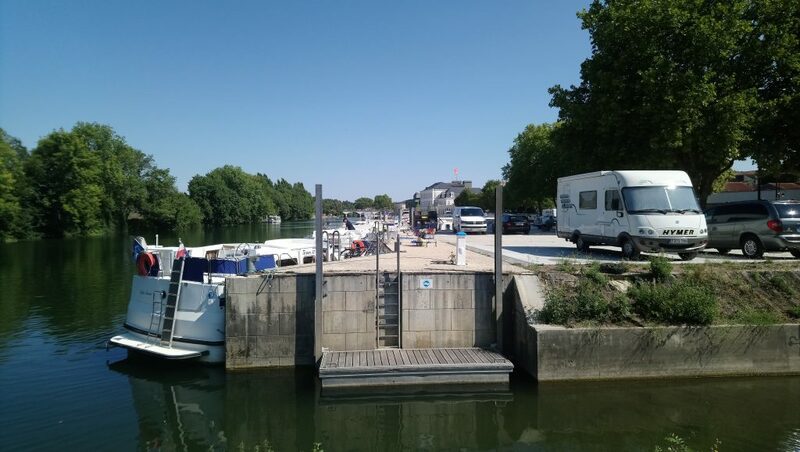 There is plenty of boat mooring in Angouleme and lots of shops on the river front to stock up on supplies. On route we happened upon a random goat at the Fleurac lock that loved a little tickle! We traveled down stream back towards Saint Simeux where we found the eel traps previously. 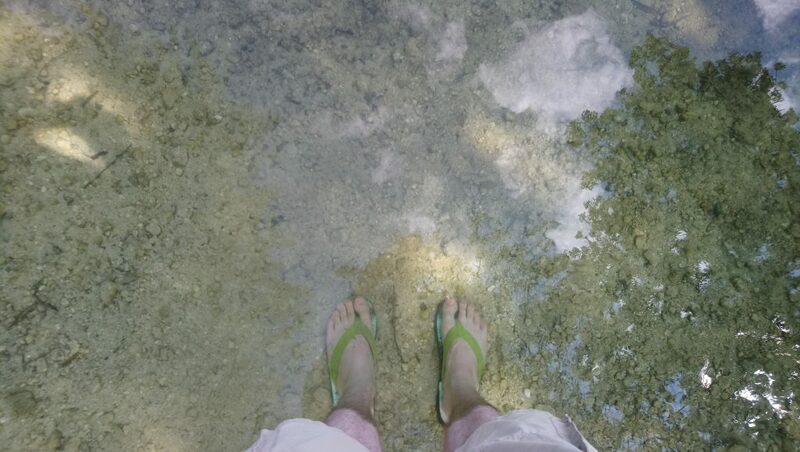 Mooring on a small pontoon with water so clear you could see everything. Here were went exploring on our bikes to find the old church at the top of the hill which held stunning views of the river and valley below. The church was closed sadly but the village is stunning with a super cute little primary school. Now I don’t normally go looking for schools while on holiday but these guys had really made their mark on the village. Everywhere you looked there were photos of children from the school and little art installations. A real sense of community. Its here we found a lovely English style pub that served great food right on the river front. http://www.pubgabariers.com/ that does take away pizza for those wanting a break from cooking. Onward and we stopped overnight at the port in Saint Simon which is an old barge building town. Interestingly there are sunken barges the whole length of the river. Some dated back hundreds of years. 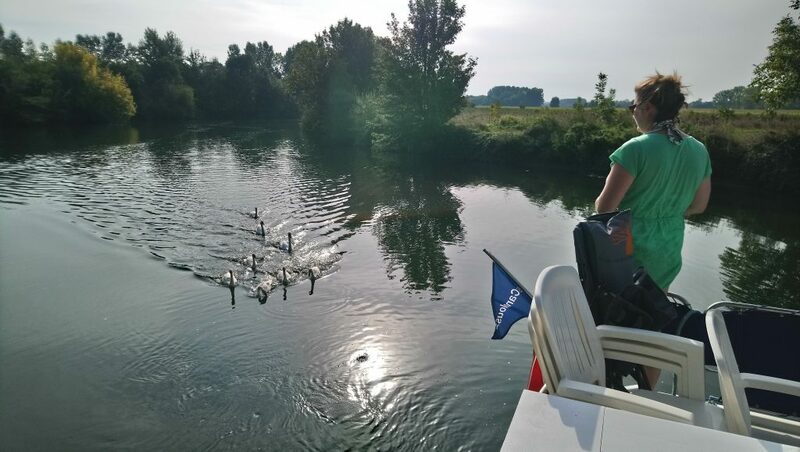 The days highlights were feeding the swans that seem to follow boats along the river until you give them something and stopping at the pontoon next the Courvoisier Chateau at Saint Brice for lunch. Lunch for us on these sorts of trips tend to be bread and charcuterie with fresh salad. We have a lovely Scandinavian couple to thank for our foray into cured meats but that’s another story! Day 5 also held another first for us! 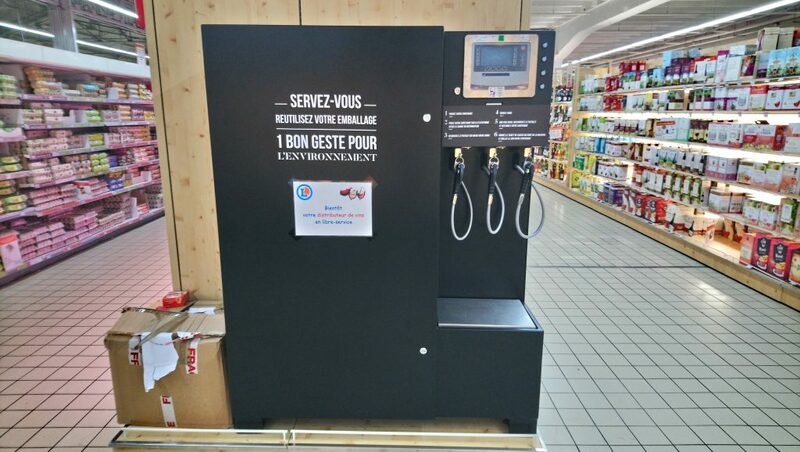 While moored near the Lecerc in Cognac for supplied we found the self-serve wine pump at the supermarket! Fab idea! Just take your own bottles etc and fill up! 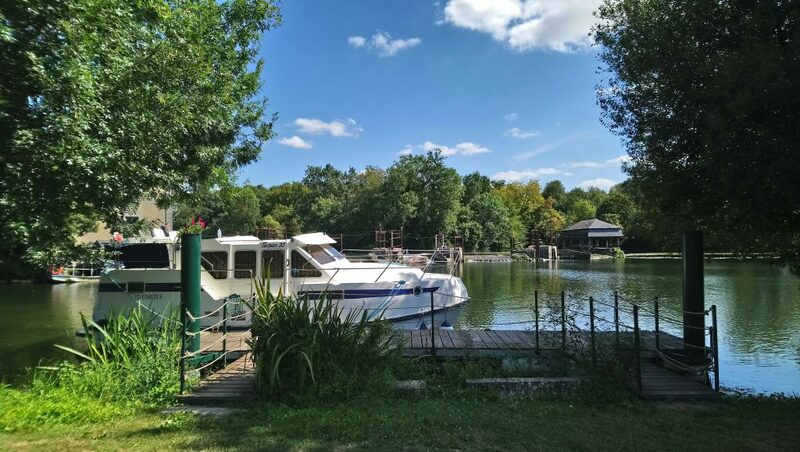 We overnighted at the pontoon at Chez Landard which offered a reserved pontoon for holiday traffic and access to the local Pineax factory (a local delicacy) and a motor home aire. 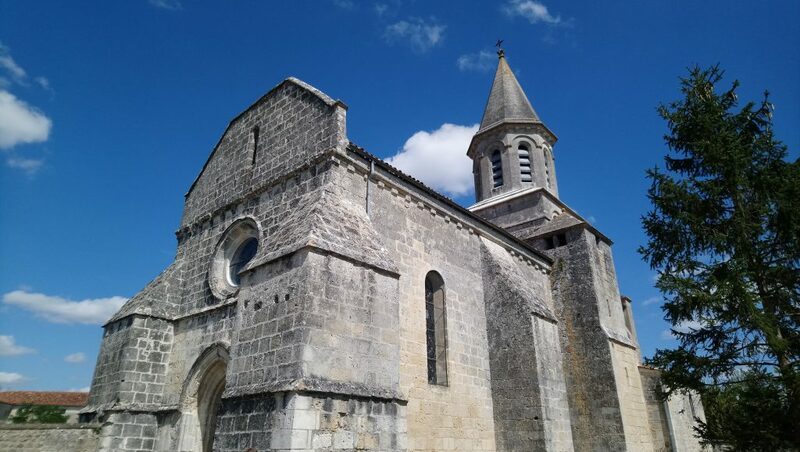 We boated downstream to Saintes and stopped for an explore of the town. Checking out the Arc de Germanicus which is a section of the old bridge that has been rebuild next to the river and then headed back upstream as there was no where to really stop overnight as its quite a small port and village. This took us past the chain ferry at Chainiers where you have to toot your horn to signal your arrival and past a cool looking campsite that had tree houses for rent. Not just the kinda thing you built as a child but 2 bedroom fully serviced set ups. 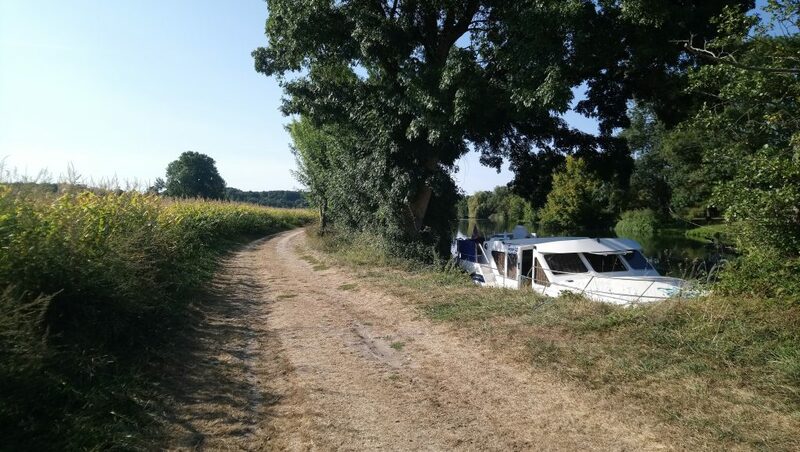 As usual we choose to moor up on the riverbank away from the Hussle and bustle near Biseuil for the night. Our final day! ☹ A short sail from Bisseuil to Cognac to hand back the boat and head back to Blighty. Our total motor time for the week was about 40 hours. Its possible to do it in much less but we like to take our time and watch the world go by. This trip we purchased the all inclusive option and so didn’t need to pay any extra for fuel which worked out in our favour. Click Here to learn how!